The Black Doll is one of the better entries in Universal's "Crime Club" series. Most of the action takes place on a dark and very stormy night, as the survivors of a long-ago mining expedition gather together in fear and trembling. It seems that a man whom the miners left for dead is very much alive and out for revenge. The killer warns each victim of impending doom by leaving behind a black voodoo doll, of which he has a seemingly endless supply. Into this highly charged situation stumbles heroine Marian Rood (Nan Grey), who may very well be linked to the murders that follow. Trying to sort out the clues are amateur sleuths Nick (Donald Woods) and Rex (William Lundigan), while the irascible Sheriff Renick (Edgar Kennedy) simmers and scowls. 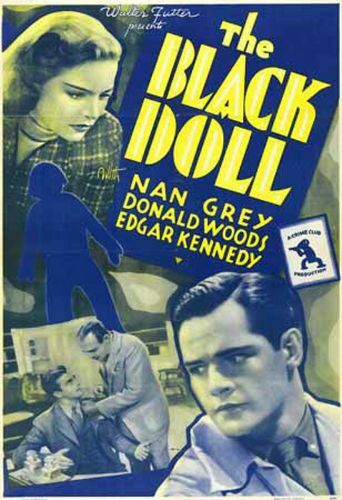 Originally released at 66 minutes, The Black Doll plays rather well in its 48-minute TV version.